It has become clear from media reports that in ongoing negotiations on the India-Japan Nuclear Agreement, the Government of Japan has caved in to demands from the Government of India that India be allowed to reprocess spent nuclear fuel. There is a danger that plutonium extracted from spent fuel generated by Japanese nuclear reactors exported to India, may be diverted to military uses, thus exacerbating nuclear weapons proliferation. Behind closed doors, the Government of Japan is planning a major policy change that is also extremely dangerous. India is not party to the Non-Proliferation Treaty (NPT) and has conducted nuclear tests on two occasions in the past. The first was in 1974 when India used plutonium it had extracted by reprocessing spent nuclear fuel and the second was in 1998. This was followed two weeks later by Pakistan, a bordering country which India has fought three wars with, testing its own nuclear bomb. The possession of nuclear weapons by these two neighbouring countries, which are often in conflict, raised the risk of nuclear war in the South Asian region to extreme levels. Negotiations on the India-Japan Nuclear Agreement have been continuing for years without agreement partly because of the strong opposition by the citizens of both countries. However, in its eagerness to export nuclear reactors, the Government of Japan is going to extraordinary lengths to accept extraordinary conditions in order to ram through this agreement. Quite simply, this is a sell-out, complete disregarding of the extreme risks in order to cash in on sales of nuclear reactors. India has consistently refused to accept the clause which cancels the agreement if India conducts another nuclear test. How can Japan, the only country in the world to have actually experienced the horrors of nuclear bombs, further spread the seeds of nuclear war, knowing the utter devastation and extreme suffering nuclear war causes? The Government of Japan must not allow the reprocessing of spent nuclear fuel. 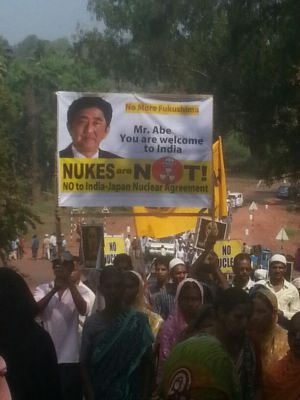 The India-Japan Nuclear Agreement must not be signed.